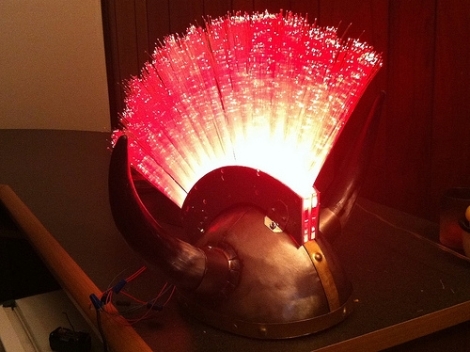 [Garrett] over at MaceTech was approached by a friend who needed a light-up mohawk installed on a Viking helmet, and he needed it ASAP. Now, [Garrett] does tons of work with LEDs but it’s not every day you are asked to construct a sound-responsive LED mohawk. He had all sorts of LEDs and other bits on hand, but finding the fiber optics that would make up the mohawk itself took a bit of time. After a bit of searching, he located some cheap bulk fiber optic toy wands, and got busy cutting them apart to remove the fiber bundles. The fibers were glued into a laser cut plastic assembly, where they were paired with a handful of OctoBrite CYANEA modules [Garrett] had on hand. He bought a handful of components from SparkFun, including an Arduino Pro Mini to control the device, as well as an electret mic and graphic equalizer chip to handle the audio input/filtering. He wrapped up the code portion of the mohawk and handed it off to his friend, who says that the “helmet is +99 to epic awesomeness”, which sounds like a ringing endorsement to us. Check out the video below to see the fiber optic mohawk helmet in action.